Making homemade chicken stock is so easy, and I don't know why I have not done this before. I felt GREAT not wasting one bit of the roasted chicken we had for dinner that evening. It does take some time to make so plan ahead. If you make chicken for dinner and want to make stock I suggest throwing your chicken bones in a big ziplock in the fridge until the next morning, unless you want to stay up till midnight like I did. Let's get started! First roast a chicken for dinner. 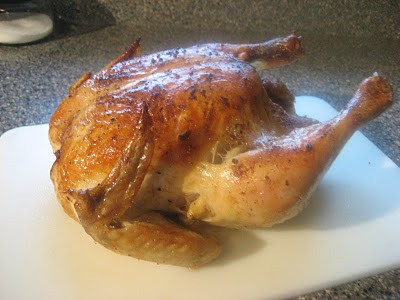 Check out this previous post all about roasting whole chickens. 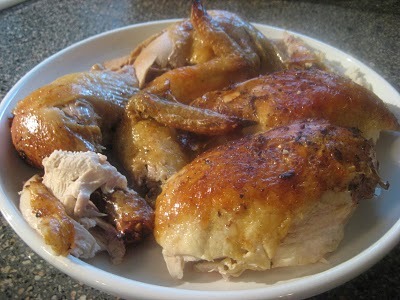 It is a very economical way to eat chicken, especially if you save your left over meat for another meal and make stock. We had this for dinner that evening, and surprisingly my mother made the same thing for dinner (she lives across the street from me). She gave me her chicken carcass since she wasn't going to save it. Shred any leftover meat off the carcass and save for another meal. This shredded chicken is perfect for soup, quesadillas, enchiladas, chicken salad sandwiches, or your favorite casserole that calls for shredded chicken. I ended up with 4 cups of leftover chicken from the two carcasses. I put them in freezer safe containers and stuck in the freezer. Now here is the recipe for making stock. This recipe from Amanada's Cooking was my starting point for making stock. She has a lot of great tips for making stock, including how to make beef stock as well. There is another great post on making chicken stock at Heavenly Homemakers. Directions: Place chicken into a LARGE stock pot. Add all remaining ingredients and fill pot with water, leaving about 2 inches of head space. Bring pot to a gentle boil over medium-high heat. Cover pot and reduce heat to low, simmer for 2 hours. Use a slotted spoon to remove the big pieces and strain the chicken broth through a sieve and discard the solids. At this point you could add some chicken base for extra flavoring. I did not having any, so I added about two teaspoons of coarse salt since it needed it. I decided after I ended up with 18 cups of chicken stock (from just two carcasses) to reduce it down to six cups of super concentrated stock since space in my freezer is limited. This took several hours to reduce, but I just simmered it away on the stove during the day and peeked at it every so often. Let the stock cool, then place in the refrigerator so that any fat left on the surface will harden. Remove the layer of hardened fat with a spoon and strain the stock through a fine mesh sieve. Store the reduced stock is plastic freezer containers, zipper snack or sandwich bags, or even ice cube trays. To use the stock, thaw, then mix 2 parts water and 1 part reduced stock. This is a great way to stretch a roasted chicken dinner. I ended up with several meals from those two roasted chickens. I used some of the homemade stock this past weekend to make Tortellini, Tomato and Spinach soup for my sister in law's baby shower. The flavor was great. If you are trying to watch your sodium making homemade stock is a great way to control your intake since canned stock tends to have quite a bit. Don't be intimidated to make stock, it is very easy. It does take some time but it is not active time. I will never throw away chicken bones again :) One suggestion I read was to keep a big ziplock bag of chicken pieces in your freezer and once you have about three pounds you can make stock. I really want to start doing this. I know it has to be a much more healthful way of cooking, and I'm sure it tastes great too. Thanks for the How To! I do that, with the keeping of frozen chicken carcasses until I have enough for broth. Lots of fun when your husband brings in the mystery bag and asks if it's edible. Nothing better than homemade stock, but I haven't tried concentrating it like that. I always wondered what the benefit was to cooking it so long. Now I know!